Row-level security (RLS) with Power BI Desktop restricts data access for given users. Filters restrict data at the row level. 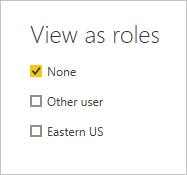 You can define filters within roles. You can now configure RLS for data models imported into Power BI with Power BI Desktop. You can also configure RLS on datasets that are using DirectQuery, such as SQL Server. Previously, you were only able to implement RLS within on-premises Analysis Services models outside of Power BI. For Analysis Services live connections, you configure Row-level security on the on-premises model. The security option does not show up for live connection datasets. If you defined roles and rules within the Power BI service, you will need to recreate those roles within Power BI Desktop and publish the report to the service. Learn more about options for RLS within the Power BI Service. Following is a list of the current limitations for row-level security on cloud models. If you previously defined roles and rules in the Power BI service, you must re-create them in Power BI Desktop. Only ETL and DirectQuery connections are supported. Live connections to Analysis Services are handled in the on-premises model. Cortana is not supported with RLS at this time. There is a known issue where you'll get an error message if you try to publish a previously published report from Power BI Desktop. The scenario is as follows. Anna has a dataset that is published to the Power BI service and has configured RLS. Anna updates the report in Power BI Desktop and republishes. Workaround: Republish the Power BI Desktop file from the Power BI service until this issue is resolved. You can do that by selecting Get Data > Files. 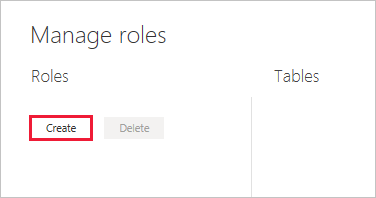 Question: What if I had previously created roles and rules for a dataset in the Power BI service? Will they still work if I do nothing? Answer: No. Visuals will not render properly. 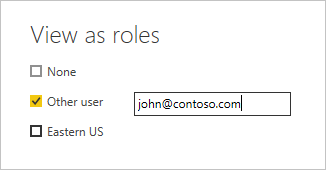 You will have to re-create the roles and rules within Power BI Desktop and then publish to the Power BI service. Question: Can I create these roles for Analysis Services data sources? Answer: You can if you imported the data into Power BI Desktop. If you are using a live connection, you will not be able to configure RLS within the Power BI service. This is defined within the Analysis Services model on-premises. Question: Can I use RLS to limit the columns or measures accessible by my users? Answer: No. If a user has access to a particular row of data, they can see all the columns of data for that row. Question: Does RLS let me hide detailed data but give access to data summarized in visuals? Answer: No, you secure individual rows of data but users can always see either the details or the summarized data.